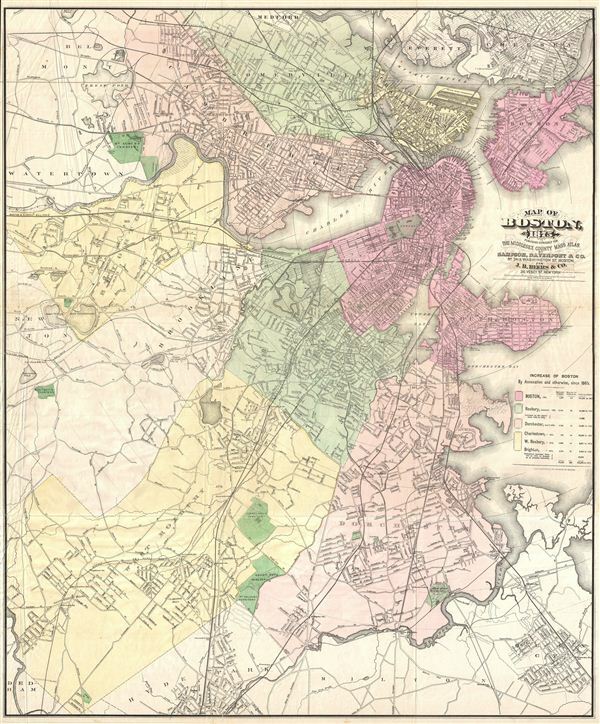 An uncommon large format map of Boston, Massachusetts issued by Mary Sampson for issue in the 1875 edition of J. B. Beers' Atlas of Middlesex County Mass. Covers all of Boston as well as the adjacent communities of Somerville, Charleston, Cambridge, Brighton, Brookline, West Roxbury, Dorchester, South Boston, east Boston, everet, and Chelsea. Offers street by street detail throughout with topographical features, parks, ponds, rail lines, and cemeteries noted. Hand tinted in various pastels to illustrate community boundaries. Mary Otis Sampson (fl. 1880 - 1910) was a Boston based publisher and president of Sampson Publishing Company. She is known to have studied art at the Boston Art Club and to have worked as an Art Editor for Photo Era a photography publication active around the turn of the century. She is the author ofThe Human Figure Beautiful, which she self-published in 1910. Ms. Sampson never married and lived most of her adult life at 39 Addington Road, Brookline, MA. Her cartographic contributions are limited to several Boston maps produced in association other publishers, including William Edwards Murdock and Charles Haynes Davenport. Mary most likely met Murdock and Davenport at the Boston Art Club, where all three were members. Beers, J. B., The Middlesex County Mass Atlas, 1875. Good. Original fold lines exhibit some wear. Some creasing in the left hand quadrants of the amp. A couple closed verso repairs. Else clean.